We’re so delighted to have Ingrid, from Edible Tapestry, back on the blog today sharing a book club recipe that she created for THE SILENT SISTER. We hope you enjoy! In Diane Chamberlain’s The Silent Sister, the character Lisa has ties to the Pacific Northwest and the East Coast, as well as an unfortunate connection to Italy. When she secretly attends her little sister, Riley’s, birthday party at a New Bern, NC seafood restaurant, hidden behind a pair of dark glasses, I was moved by the scene, but disappointed when she fled the eatery before enjoying the stuffed flounder she’d ordered. I was a big fan of the incumbent offering of crab stuffed flounder that appeared on so many seafood dive menus when I was growing up in Florida, so the fact that she missed out on the meal left me with an unexpected craving. Fish is usually the last food item to set my culinary wheels turning, but when I thought of Italian rice balls and Southern pecan crusted fish, I began toying with the idea of substituting salmon for the flounder because of Lisa’s Seattle connection. 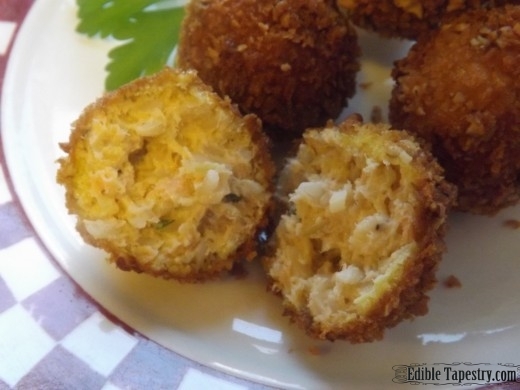 From there, stopping short of throwing lump crab meat into the mix, I was easily able to pull my ideas together to make Arancini. 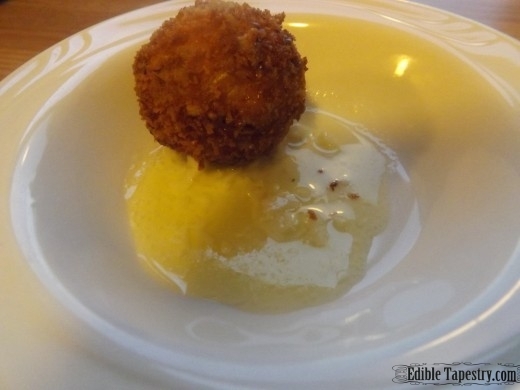 While Arancini are typically made with risotto, which is traditionally prepared using arborio rice, I simply cooked brown rice in broth to make my little rice balls, for a more nutritious version. The amount of asiago cheese I added to the filling, coupled with the fact that the rice balls are deep fried in a panko and pecan breading, may have canceled out the heart-healthy benefits of the brown rice and salmon filets, but the end result was a crunchy and tasty fun food that I was very pleased to bite into. A little garlic butter for dipping skyrocketed them to the top of the list of seafood dishes that I adore. Oil for frying. I used half Greek olive oil, half vegetable oil. 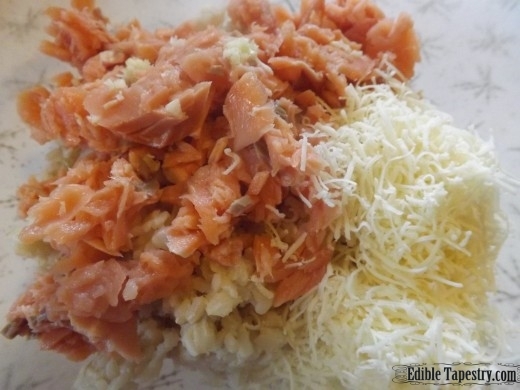 To make the balls, combine the rice, salmon, cheese, garlic, salt & pepper, parsley, and one egg in a mixing bowl. 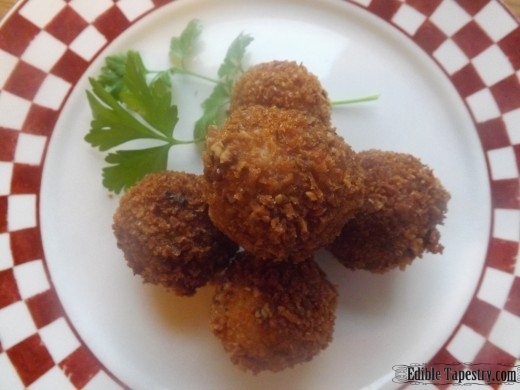 Shape and compress it into balls around 1″ in diameter, the same way you would make meatballs. 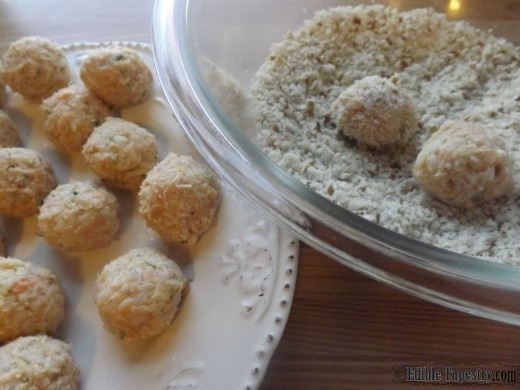 Place the rolled balls on a plate and chill until firm. 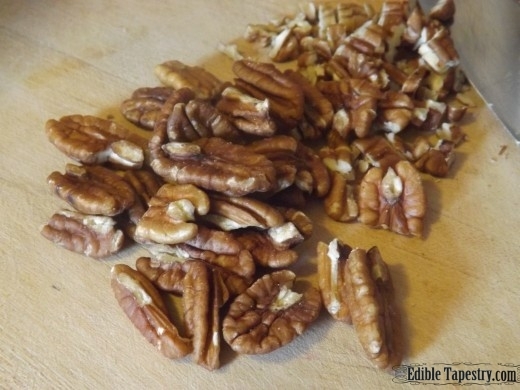 Combine the pecans and panko in a large mixing bowl. Beat the remaining two eggs in another bowl. Heat the oil in a pan to a depth of around an inch and a half. 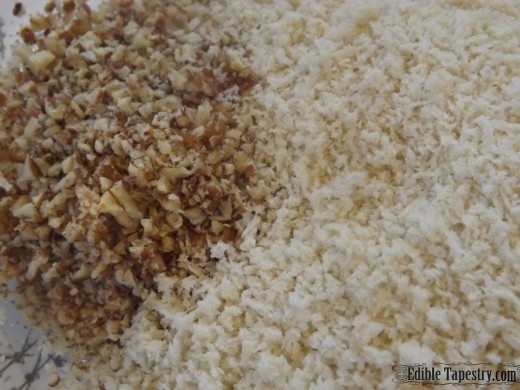 Test the temperature by dropping a bit of egg, coated in the panko/pecan breading into the heated oil. If it bubbles gently, it is ready, but it should not pop and sizzle, violently. 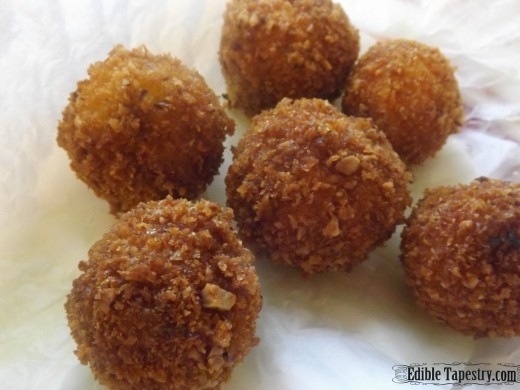 Dip each rice ball into the egg, then into the panko/pecans. Rolling to completely cover. 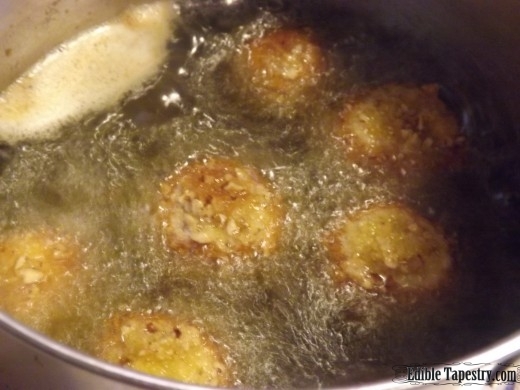 Drop a few at a time into the hot oil and fry until browned, turning as necessary to completely cook them while being careful not to overcrowd the oil and bring down its temperature. Remove them from the oil with a slotted spoon and to drain on absorbent paper. To make the dipping sauce, just melt the butter in saucepan over low heat and toss in the garlic. Keep warm for serving with a candle-lit fondue warmer or mini slow cooker. This recipe looks delicious! Printing it out as I type. The Silent Sister is at the top of my TBR pile so what perfect timing also. Thank you! Has She Reads done an interview with this author? I am deep into the story and enjoying it immensely. The fish recipe looks yummy and rice balls scrumptious. I like the brown rice substitution. Will def be trying these! I’m a huge fan of salmon but I prefer mine au naturale! Still, I’m going to hold onto this recipe. Thanks!